I'm quite positive that proper spring is here. Outdoor temperatures stay around pleasant 18 degrees and sunshine do it's work on my garden. I will update you on garden news soon as the little patch of green that makes me so happy has grown rapidly during the last two weeks. I still have to wait to harvest my own tomatoes, however I have sufficient supply of fresh herbs and baby lettuce and spinach leaves that we treat ourselves to regularly. Warm and sunny weather also means that I tend to cook and eat lighter food with enough fresh fruit and vegetables. 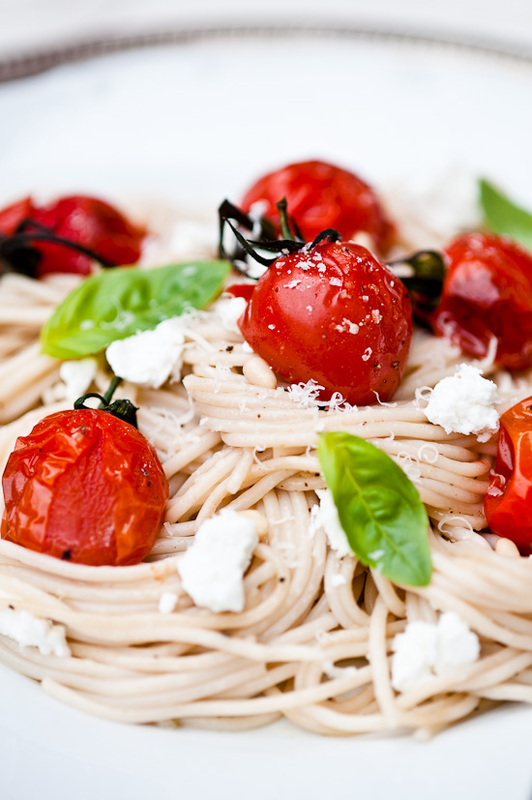 Pasta is, however, something constant on our menu throughout the year. I've already told you many times I'm a pasta maniac, haven't I? 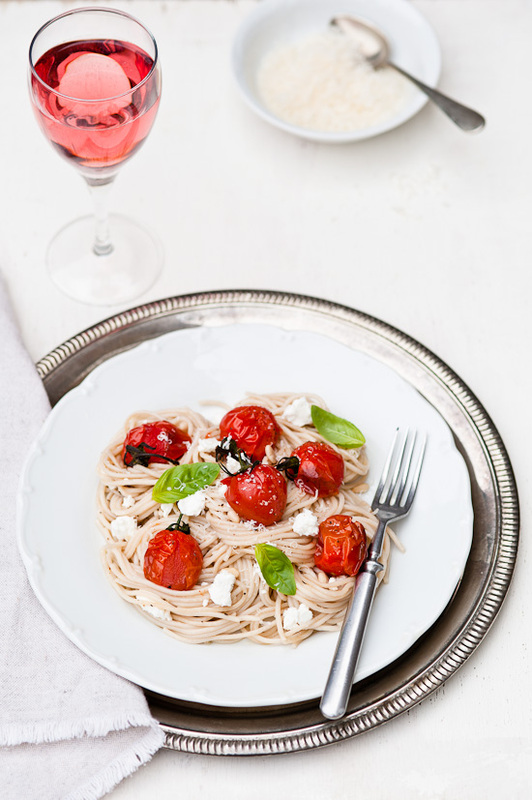 This pasta dish is very quick and easy to make. It's exactly the type of food I like to cook especially during hot months, when you don't want to spent long hours near a hot stove. You can easily use any leftover pasta which you just heat up and toss with the rest of ingredients. The combo of roasted cherry tomatoes and goat cheese is fantastic on it's own. I can imagine making roasted tomato and goat cheese bruschetta, or adding both in a salad. Options are endless here, you can never go wrong with tomatoes and cheese. It's time to think about Saturday lunch. Have a wonderful weekend! Preheat oven to 180°C. 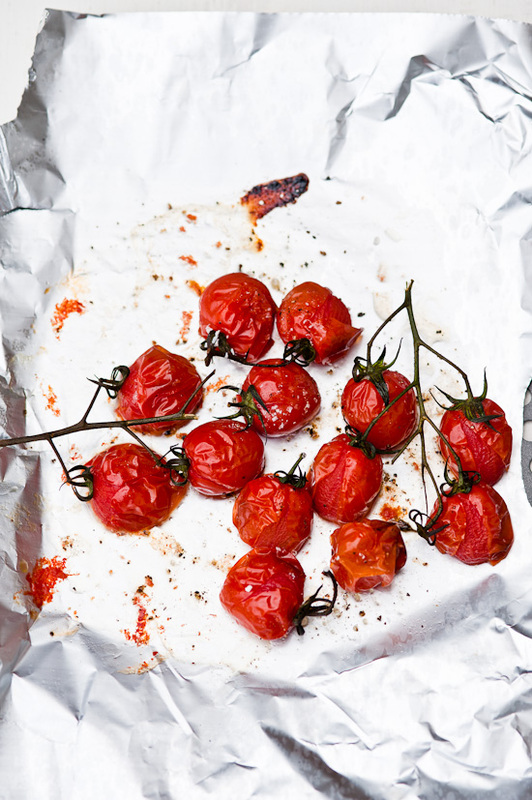 Place the tomatoes rubbed in olive oil on a baking tray, sprinkle with salt and pepper and bake for 20 minutes. Meanwhile, cook spaghetti according to package directions. When the pasta is ready, drain and return to the pan. In a small bowl, mix the olive oil, garlic, pine nuts, salt and pepper. Add to the pasta with half of the goat cheese and parmesan and toss to combine. 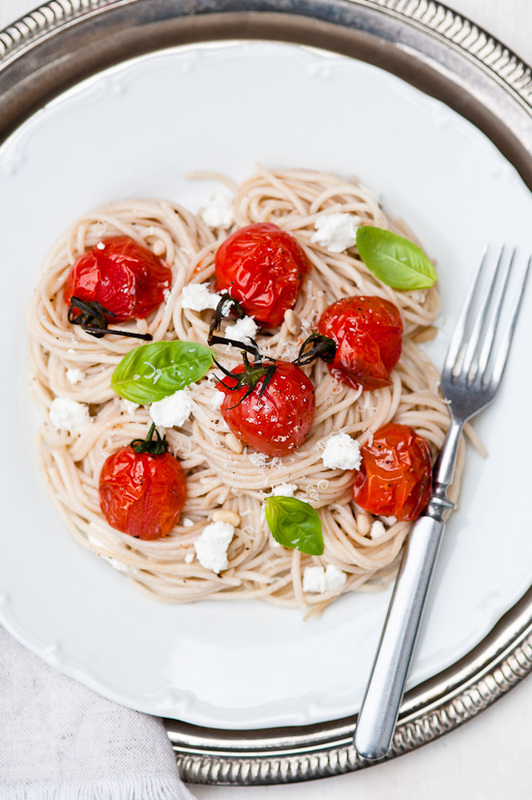 Divide pasta between two plates and place cherry tomatoes on top. Sprinkle the rest of goat cheese and basil on top, and serve.